DBA manages the entire manufacturing side of your business and therefore it is absolutely essential that you implement a daily backup strategy that protects your valuable data and insures against a system shutdown. Database loss or failure can occur from sources outside the control of the software, including power outages, hardware failure, natural disasters, and theft. Do not assume that the software can be repaired if corrupted. If any of these events occur, your only remedy is to restore from backup. If you happen to experience database failure and do not have a backup, it is a catastrophic event for your company that could imperil its very existence. You will lose all or most of your history and it can take weeks to reassemble a system from scratch. Making daily backups is your responsibility. If you experience database failure, we can offer no remedy other than to restore from backup. Your daily backup strategy should include local backup, a mirror copy to an external drive/device, and off-site backup. Off-site backup is essential because a local backup provides no protection for fire or theft. So always make local backups and off-site backups. The Backup Manager is an external utility that is used to create database backups, to restore from backup when needed, and to optimize your database performance with a simultaneous backup and restore. The Backup Manager is not a generic backup utility that can be used with multiple file types. Its sole purpose is to create database backups that can then be safely backed up to an external drive and off-site using a generic backup program or service. So whenever you restore from an FBK backup file, your database is optimized to be leaner and more efficient. When an FBK backup file is being created, the backup process will fail if data corruption is encountered that cannot be fixed. The benefit from this is that if yesterday’s FBK file was successfully created, you know with confidence that the data corruption occurred in your most recent business day. You can therefore safely restore from yesterday’s backup and you minimize any data loss to just one day. You will continue to make a general daily backup of all the critical data folders on your server, not just for DBA but for other applications as well. The general daily backup should incorporate the (drive letter)\ProgramData\DBABackup folder, which contains your FBK backup files. 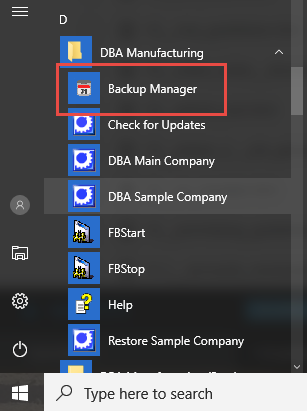 The Backup Manager is accessed from the server by clicking Windows Start – DBA Manufacturing – Utilities – Backup Manager. Use this option to make a manual backup of a registered company database. A manual backup should always be made prior to installing a product update. Use this option to schedule daily backups of your registered company databases and System database. These backups create FBK files that will then be backed up offsite by your daily server backup. NOTE: You will continue to make a general daily backup of all the critical data folders on your server, not just for DBA but for other applications as well. The daily server backup should incorporate the (drive letter)\ProgramData\DBABackup folder, which contains your FBK backup files. Use this option to restore data from a backup. Use this option to perform a GBAK backup and restore in a single process. We recommend running this process on a periodic basis, such as once a quarter, to maintain optimal database performance. All DBA users must be out of the system to perform this one step Backup and Restore. 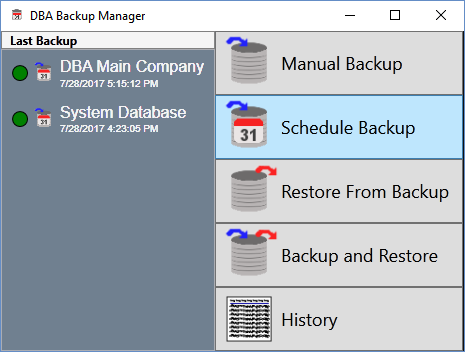 Use this option to view Backup Manager history, including manual backups, scheduled backups, and restores from backup.